In 4-quart saucepan, heat oil over medium heat. Add the onion and salt; cook until softened, about 4 minutes. Add garlic, thyme and oregano; cook 2 minutes. Stir in tomatoes, cannellini beans, zucchini, carrot, green beans and macaroni. Add stock; heat to simmering over medium-high heat. Cook 6 to 8 minutes or until macaroni is al dente. Top with Parmesan cheese. To freeze: In 8-inch skillet, heat oil over medium heat. Add onion and salt; cook about 4 minutes or until softened. Add garlic, thyme and oregano; cook 2 minutes. Transfer to medium bowl. Stir in tomatoes and cannellini beans. Transfer to 1-quart resealable freezer plastic bag. Mix zucchini, carrot, green beans and macaroni in another 1-quart resealable freezer plastic bag. Freeze both bags up to 3 months. When ready to serve: In 4-quart saucepan, mix broth and bag of frozen tomato-bean mixture; heat to simmering over medium-high heat. Reduce heat to medium; cook until frozen tomato-bean mixture is completely thawed, stirring occasionally. Add bag of vegetables and macaroni; return to simmering. Cook 6 to 8 minutes or until macaroni is al dente. Top with Parmesan cheese. Lots of fun small pasta shapes are on your grocery store shelves. Try ditalini, orzo or small shells for a change of pace from elbow macaroni. 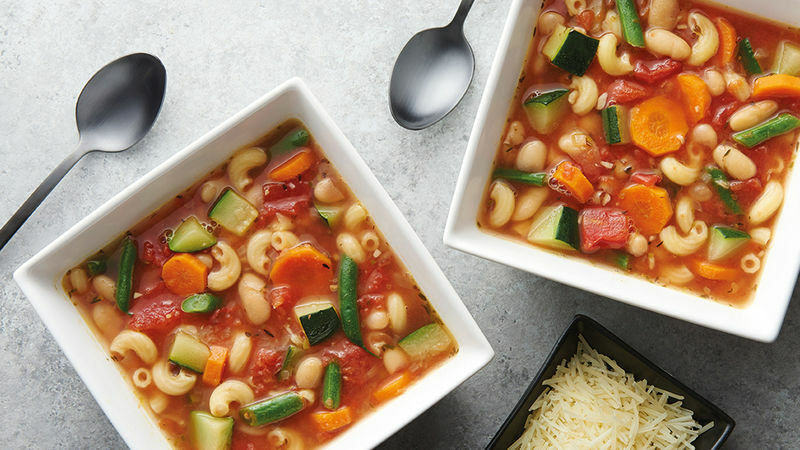 Canned chickpeas are a good substitute for the cannellini beans in this soup.